The entelli-Ballast™ from enLight® is unique in its class. One single unit that is truly energy efficient and can power all 26-150 watt lamps regardless of the type or manufacturer. Many lamps, one ballast – simple. And as it supports mains supply from 100-265V AC or DC, it can be used in most lighting markets around the world. Its Ultra Soft Start Technology™ starts lamps with ease, cleans old lamps within minutes and extends lamp life to 2-3 times their expected natural life. Full linear dimming to any percentage from 30% to 100% is smooth and simple. It is fully reverse compatible – designed to replace old ballasts simply and quickly. As it is a constant power device, inrush current is virtually eliminated and by offsetting the startup timing of each lamppost, the surge on the local network can be massively reduced. The ballast itself is also capable of measuring energy consumption to an accuracy accepted by the retail energy market (at least in the EU) so it is ready for the switch from unmetered to metered supply. Proven in-field for longer lamp life - 9 years and counting for standard SON lamps. Can you afford not to speak to us? 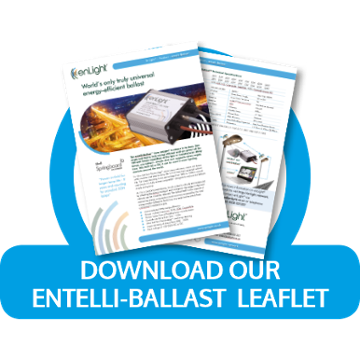 The enLight entelli-Ballast™ is designed to work in harmony with the enLight® DOLFin® and communicate via the enTalk™ mesh network Together, these three components take remote lighting management to an unprecedented new level of simplicity, flexibility and efficiency. Despite the world moving steadily towards solid state lighting, HID is still predicted to deploy in significant numbers and the replacement market is still very healthy for HID technology. There may be a preference for monochromatic light due to conservation requirements or they may have replaced all the lanterns within the last 10-15 years and are reluctant to be seen to be throwing perfectly good equipment into landfill. Either way, even the lighting industry itself is predicting HID to still have the majority market share in 2020. This technology could provide sufficient differentiation to maximise margins in an HID market gradually diminishing over time. We would be happy to talk to those interested in taking this technology to scale so please contact us on +44 (0) 1508 521227.